Paul G. Harris (ed. 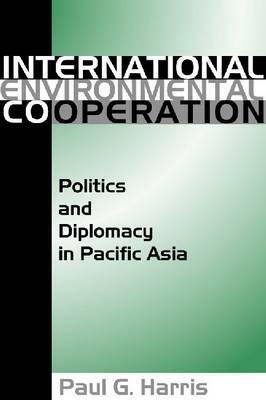 ), International Environmental Cooperation: Politics and Diplomacy in Pacific Asia (University Press of Colorado, 2002). As the twenty-first century commenced, the countries of Pacific Asia were grappling with the impact of regional development, industrialization and economic growth on their increasingly acute environmental problems. International Environmental Cooperation: Politics and Diplomacy in Pacific Asia brings together innovative and insightful studies of international environmental politics in this increasingly critical part of the world. The first section of the book examines many of the issues and actors impacting international environmental cooperation, highlighting important themes such as cooperation between developed and developing countries, international justice and regional environmental security. Chapters in the first section illustrate key features of specific multilateral environmental agreements and the competing interests of important national bodies, international organizations, multinational corporations and nongovernmental entities. The second section of the book focuses on environmental diplomacy and regime building in Pacific Asia, examining issues such as acid rain, nuclear waste, deforestation and conflict over regional seas. Contributors from Asia, Europe and North America bring an international perspective to questions of environmental cooperation. International Environmental Cooperation provides policymakers, citizens, scholars and students with essential information for understanding and addressing some of the world’s most significant environmental problems.